You may have noted that unlike most of our previous games, there is no online registration code on the back of the Cargo Noir rules booklet. We’re experimenting with a new trust-based, code-less, registration system. 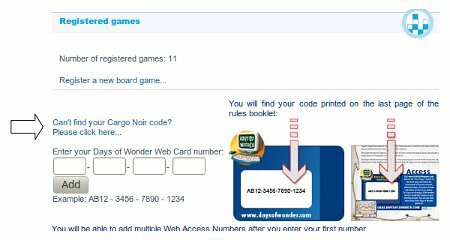 If you already have a Days of Wonder online account, simply log on; go to your My Board Games page ; click on Register a new Board Game and follow the Can’t find your Cargo Noir code? link. Confirm by pushing the I Own Cargo Noir button, and it will be added to your list of registered games. A 10% Web Store discount coupon will be automatically added to your account. 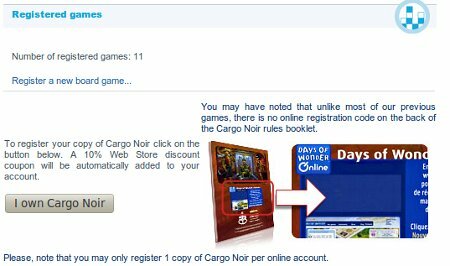 Note that you may only register 1 copy of Cargo Noir per online account. Cargo Noir owners who do not already have a Days of Wonder Online account: go to daysofwonder.com and click on the New player? link in the upper right hand corner of the page to register. Fill in the registration form, and at the bottom of the page, click on the Can’t find your Cargo Noir code? link. Confirm your registration by pressing the Register button and you are done. This entry was posted on Thursday, March 10th, 2011 at 15:47 and is filed under Cargo Noir, Games, News, Websites. You can follow any responses to this entry through the RSS 2.0 feed. Both comments and pings are currently closed.